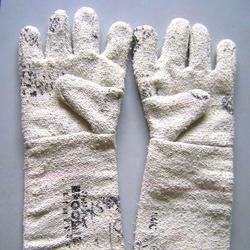 We are a leading Exporter of asbestos hand gloves from Ahmedabad, India. We have set a benchmark in the industry for supplying and wholesaling Safety Hand Gloves. The offered hand gloves are perfect in terms of fit, skin-friendly and comfortable. These are resistant to reactivity with chemicals and are extensively demanded in chemical and pharmaceutical industries. The offered gloves are durable, resistant to wear & tear, easy to wash and require low maintenance. Looking for Safety Hand Gloves ?